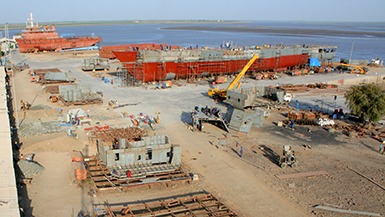 Good water depth of about 7.5 meters at low tide make the 36 acre Shipyard ideal for construction of a wide variety of vessels including non-standard dimensions - upto 140m length and 35m breadth. Vast area stretching along the waterfront has enabled strategic and generous yard design. 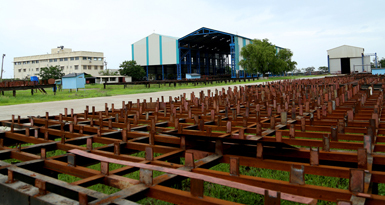 Prefabrication areas, skids and berths are planned to complement each other for optimum capacity utilization. Classic production bottlenecks are eliminated: there is smooth and consistent production flow. Area approx 39,000 sq m.
Contains administrative offices, steel stockyard, blasting and painting area, prefabrication area for production of CNC cut members, shaping and bending of plates and structural members, workshops, skids, worker and staff quarters. Fabricated sections are moved to berths in the South Yard by cranes and trailers, axles etc. Area approx 1,08,000 sq m, 600 m waterfront. Contains site offices, stores for outfit items, building berths, slipways, outfit wharf. Also adequate free yard space for additional on site fabrication.